Guns N' Roses reunion rumours. Nothing new, we know. 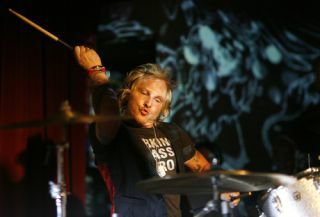 But with talk of the band getting back together to mark their induction into the Rock 'n' Roll Hall of Fame next year, Matt Sorum has spoken out about the chances of getting back behind the kit for the Gunners. When asked about the possibility of a GN'R reunion, Sorum told Triple M radio station: "You never know. Usually the way it works with Guns N' Roses is that it's gotta be about Slash and Axl first, which has been a little bit of a problem. Duff [McKagan, bass] played with Axl and actually Duff was gonna go out on tour with Axl." On the current state of the band, he added: "I'm not saying I'm an original member, okay, but I understand the core of the band, which is Slash and Duff and probably Izzy. It's a shame, and you know what, this goes back to a Paul McCartney thing. Does he call himself The Beatles? Not saying we were as big as The Beatles, but does Sting call himself The Police? No. Does Jimmy Page and Robert Plant go out there calling themselves Led Zeppelin? Nope." What do you think about a GN'R reunion? Worth seeing? A car crash waiting to happen? And who would you have behind the kit?